The two of you are always looking sharp. So should your invitation! Shaded corners highlight your wording on this stunning wedding invitation. 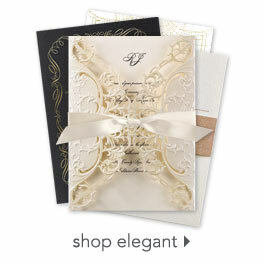 Our Deluxe Collection of wedding invitations features foil stamping. Choose a matte or shimmer foil, paper color and up to two lettering styles for your wording. Design and wording print in the same foil color. Invitation includes inner and outer envelopes. Personalization Options: Your choice of foil color, fonts and wording. Please Note: You may choose a matte or shimmer foil for this invitation. I love everything, except the antique gold outer envelope does not really look gold. It's very pale, almost like metallic beige. The design and font of the invitation is beautiful and elegant. Because the navy paper is too dark for a response card, I ordered the response cards in blush, with navy foil writing, which is a perfect compliment to the ecru writing on the invitation. I would highly recommend the envelope addressing service! Saves time and frustration from handwriting, and looks very professional. The only minor flaw I found with the invitation was that the ink in the border blotted out of the line in one small place (I will probably be the only one to notice). Overall I love these invitations, would order them over again, and have recommended to friends. The customer service line was helpful and polite. Items shipped quickly. LOVE my invites!!! LOVE the option to address them for me. I was dreading that part!!! LOVE the pricing!!! I saved SO much money! The only problem I had was the envelopes were printed with someone else's address list. I called and the rep was very helpful and apologetic. Everything was corrected at their expense and I received my corrections within 2 days!My only complaint is that I wanted a formal interlocking Vine monogram for my thank you cards. It would have been fantastic in the same type of paper and in the same ink ask my invites. This option wasn't available. Maybe in the future.... I actually couldn't find anything like that anywhere. I ended up getting my graphic designer sister to design it for me. I will always recommend Invitations by Dawn to anyone that asks. These are so classy and elegant. We ended up going with the chocolate brown shimmery paper with the gold foil in a different font than the one used in the image online. The shimmery paper is to die for--just the perfect amount of blingy-ness. Order them! You can't go wrong. I was really pleased with the online proofing process and their willingness to get it perfect. I requested 1 adjustment and they completed it quickly and had it sent to me again for review. Shipping was fast as well.